The Magnesium Oxide Board (Glass Magnesium Board or MgO Board)is made of filling materials, such as sawdust and all kinds of crushed plant straw (you can select any one kind ) and several chemical raw materials which are token as modified material after special technology. The board has such features: quickly hard, high strength, large format, fireproofing, dampproof and good waterproof performance. It can be nailed, planed and sticked, so it can be used widely at indoor decoration, such as wall skirting and ceiling of market, hotel, club, station, office building and living room. And it can get large usage at top-grade furniture, door and partition. This product is made of waste materials, and it is ideal product which can replace all kinds of wood broad with reasonable price and good quality. Production line for Magnesium Oxide Board (Glass Magnesium Board or MgO Board)with fashionable design, reasonable structure, stable running manufactured board of even thickness in large production once through double- roller-extruding technology. This production line is equipped with shaking device which remove inside and outside air bubble, so our board is more compact. In addition, we use the no-woven cloth as the separating film to increase the toughness and strength of the board. 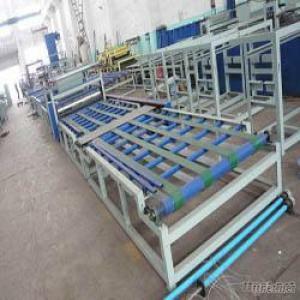 The machine can be adjusted arbitrarily, and then produce the board with the thickness of 2-60mm, the biggest width of 1, 300mm and unlimited length. So you can adjust the thickness of board at will. The machine can produce all kinds of products, such as simulated manchurian ash board, simulated beech board, oak board, fireproof raised door board, skirting board, ceiling board and wall decorating mural painting. (1) Simulated wooden board: After state-level testing, its appearance is the same as that of the wooden board, and its decorating effect, performance and performance-to-price ratio are all better than the same board. With a large breadth, it not only has the features which the wooden board owns, such as nailed, sawed, planed and sticked, but also don’t need painting, so it is green environment-friendly. For example: simulated beech board, red (black) walnut board and bubinga (Canthor). Machinery, Hardware & Construction Material Making Machinery, Hardware & Construction Material Making Machinery/n.e.s.